It's that time of year again. Turkey appreciation day! Other wise known as Thanksgiving. 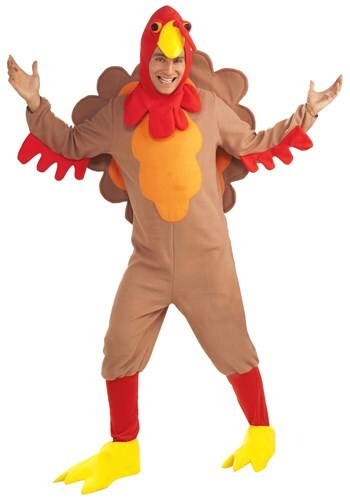 This is the day that Americans consume 46 million turkeys. And one lucky turkey is saved by the President of the United States. How are you going to celebrate your turkey day? Eating or pardoning? Or are you going to do something completely surprising? Are you going to shock your family when you show up dressed in this Adult Fleece Turkey Costume? They will be asking if you have lost your mind. Dressing up as the thing you are about to eat. Just remind your folks that turkeys are omnivores, meaning they eat whatever is in front of them. Especially perfectly roasted, melt in your mouth Thanksgiving Day turkey with all the fixin's. Enjoy the look of shock on the faces of your adult relatives. And the sweet smiles, and giggles of your younger family members. The kids will all want to take a ride on the turkey who showed up to participate in the festivities. They will all insist on "turkey" back rides around the house. Don't worry everybody else will warm up to the idea when they see you playing with the kids. Then eat your weight in stuffing, cranberry sauce, mashed potatoes, and don't forget to try a little bird. And after everyone as had a little time to let all the food settle, and your brother challenges you to a Turkey Day football scrimmage, tell him you can still beat him with one wing tied behind your back!